Efforts to impugn the credibility of members of the Congressional Black Caucus and leaders of the Women’s March for being in the same room as Nation of Islam Minister Louis Farrakhan, would be laughable if their motives weren’t politically motivated and there wasn’t an historical precedence for their actions. The Republican Jewish Coalition, the Anti-Defamation League, the Southern Poverty Law Center as well as Jewish, conservative and mainstream media publications have joined the assault on those who attended a speech, dinner or meetings with the Minister. The Republican Jewish Coalition demanded that seven Black congressmen resign for having some interaction with the Minister following controversy after a major speech Feb. 25 in Chicago. The group called on Representatives Keith Ellison (D-Minn.), Barbara Lee (D-Calif.), Maxine Waters (D-Calif.), Danny Davis (D-Ill.), Andre Carson (D-Ind. ); Gregory Meeks (D-N.Y.) and Al Green (D-Texas) to resign. Chicago Democrat Davis initially responded by citing his history of opposing bigotry, but did not denounce Minister Farrakhan in interviews with the Daily Caller, a right wing website. Jewish pressure kept building and by the evening of March 8, Rep. Davis had joined Rep. Lee, Rep. Meeks and Rep. Ellison in disavowing the Minister. Mr. Muhammad pointed to a resolution introduced by Rep. Todd Rokita (R-Ind.) condemning Min. 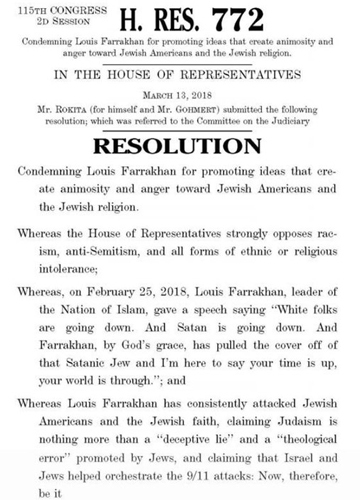 Farrakhan “for spreading ideas that generate animosity and anger towards Jewish Americans.” It harkens back to a Senate repudiation of the Minister over 30 years ago. The RJC and GOP groups want to see if they can negatively impact Black voters enough and women voters enough to protect Mr. Trump and his party in mid-term elections. Former Temple University professor Dr. Tony Monteiro said that Min. Farrakhan’s support among the Black masses isn’t going away. If anything this heightened attention, though negative, will only increase Min. Farrakhan’s support, predicted Dr. Monteiro. “Black people vote consistently against right-wing Republicans and right-wing Democrats more than any other group (including Jews) in the country,” he noted. 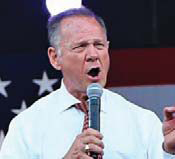 “Take for example the 2017 Alabama (Senate) race, where Roy Moore the Republican candidate of the Trump administration, the candidate of the national Republican Party, and the candidate of the extreme right, was defeated in Alabama,” Dr. Monteiro continued. Mr. Moore lost “because 97 percent of Black women and 95 percent of Black men voted against him,” he said. So if Black people, because of their support for Min. Farrakhan, are the most anti-Semitic, how do you explain that the group is most likely to vote against far right wing candidates? Using Min. Farrakhan to discredit members of the CBC and members of the Women’s March will backfire, he said. “It will give Farrakhan more publicity and heighten his recognition among African Americans, among African American leaders, including elected officials. And certainly the future looks bright for his impact upon the thinking of the African American community,” argued Dr. Monteiro. “My point is why is it that other Jewish organizations have not enthusiastically joined what they are doing? Is it because they saw it as a weapon posed against Democrats and Democratic interest? So they didn’t join in, at least in the beginning, because it had to do with something designed to hurt Democratic political interests,” he said. Mr. Muhammad said those who think Muslims aren’t involved in electoral politics should consider this: “You’re involved because we’re being used to affect the outcome. They don’t care if we never go to a poll, if they can use us to serve their political interests. And so when you see that, it tells us the importance of the Farrakhan Factor politically. And whether we want to participate in electoral politics or not, they’ll bring us into it in a major way involuntarily,” he said.